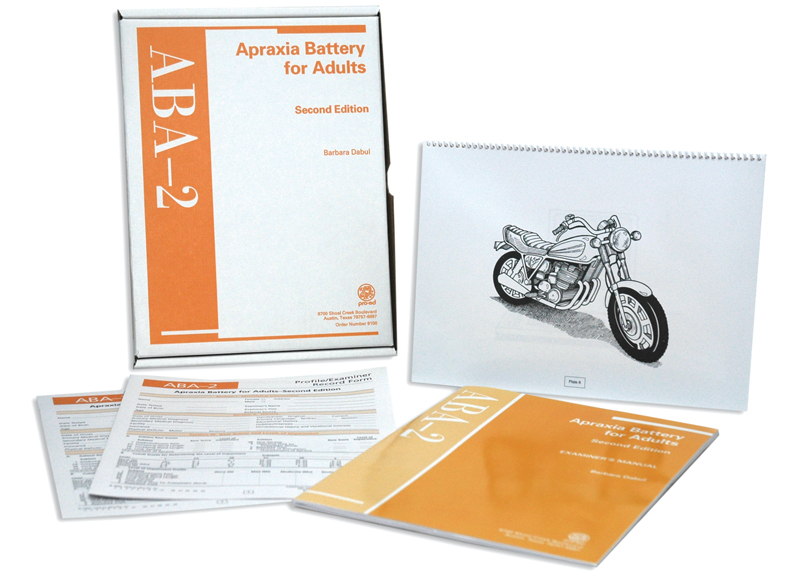 ABA-2: Apraxia Battery for Adults–Second Edition KIT Barbara L. Dabul : LinguiSystems, Inc. The ABA-2 has been updated and redesigned. Those features clinicians found useful were preserved, and added features make the test even more effective at detecting the severity of apraxia. More difficult items have been added to two subtests to raise the ceiling so clinicians can identify patients with mild apraxia. Pictures and items have been updated and new normative data were collected in the Fall and Spring of 1998 and 1999. The new Level of Impairment Profile yields a pattern of scores that describes one of several different types of apraxic speakers. Test reliability, investigated by the coefficient alpha, is high (reliability coefficients of .83 to .99 were obtained for all subtests). Content, criterion-related validity, and construct validity were studied through a review of the literature, item analysis, comparing the results of the ABA-2 to the Porch Index of Communicative Ability, comparing differences in scores on the ABA-2 of various subpoplulations, and examining the correlations of the subtests. Results indicate that examiners can use the ABA-2 with confidence.